Nutella Swirl Pumpkin Bread is special enough for a holiday brunch but also perfect for any chilly fall morning. 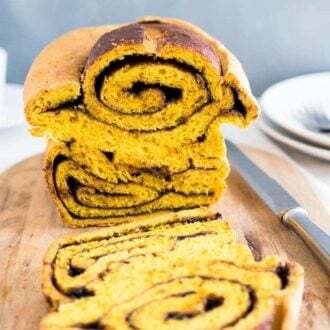 Swirls of chocolate hazelnut spread and a pumpkin enriched yeast dough make this loaf a delicious and decadent treat! Grease a large bowl with butter or spray with nonstick spray. Set aside. In a small bowl combine lukewarm (not hot!) whole milk, granulated sugar, and yeast. Let stand for 5 minutes until slightly frothy. Meanwhile, in the bowl of stand mixer fitted with the paddle attachment, cream 6 tbsp of butter with brown sugar, salt, pumpkin spice, and orange zest at medium-high speed for about 2 minutes until light in color. Add vanilla extract, egg, and pumpkin puree, beat for 1 more minute until incorporated. Then add the yeast mixture, beat at low speed until fully incorporated. Switch to the hook attachment. Add 4 cups of bread flour and knead at low speed until incorporated. Then knead the dough with the mixer on medium-low speed for 5 minutes until the dough is smooth. It will be very soft, but should not be sticky. On a lightly floured surface smooth the dough into a ball and place it into the prepared greased bowl. Cover with plastic wrap and place in a warm spot to rise until doubled in size - around 1.5 hours. Grease a 10 by 5-inch Loaf Pan with butter. Punch down the dough and turn out onto a lightly floured work surface. Flour your rolling pin and roll the dough into a 12-by-18-inch rectangle. It should be about 1/8-inch thick. Spread the Nutella over the dough, leaving a 1-inch border around the sides. Roll the dough up very tightly into a log, starting along the longer side. Pinch the edges to seal the seams and fold the ends in. Tuck the bread into the greased loaf pan with the seam side down. Cover loosely and let rise in a warm environment again until the dough rises to the top of the pan, about 30 minutes. Preheat oven to 350°F (180°C).Brush the top of the bread with melted butter and slash down the middle. Bake in the center of the oven for about 1 hour until the top is deep golden brown and top of the loaf sounds hollow when tapped. Transfer to a wire rack and allow to cool in the pan for 10 minutes. Then use a spatula or knife to loosen the bread from the pan and allow to cool completely on the wire rack before slicing.